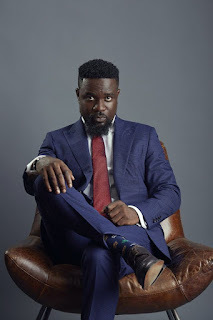 Sarkcess music CEO, Sarkodie born Michael Owusu Addo has been ranked the second highest music earner on the African continent. The 5th All Africa Music Awards Business Summit which was held at the Ballroom inside the Kempinski Hotel gave a list of top 10 Africa music earners for the year 2017. EIB Network CEO, Bola Ray who gave the presentation revealed rapper Sarkodie as the only Ghanaian who appeared on the list occupying the 2nd position. 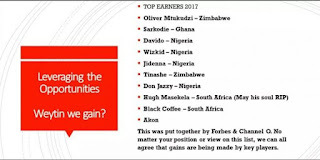 The list was compiled through an in-depth research carried out by Forbes in collaboration with Channel O. The list ranging from the top includes Oliver Mtukudzi – Zimbabwe, Sarkodie – Ghana, Davido – Nigeria, Wizkid – Nigeria, Jidenna – Nigeria, Tinashe – Zimbabwe, Don jazzy – Nigeria, Hugh Masekela – South Africa (May his soul RIP), Black Coffee – South Africa and Akon. Sarkidie is undoubtedly one of the successful artists on the African continent when it comes to everything. He has won for himself numerous awards on both local and foreign platforms which makes him a recognizable musician in the world. Measuring success base on wealth, the Sarkcess music boss wealth more than millions of dollars and is one of the richest artists in Africa.